Photo by Job van Nes. Only since 1801 has there been a united Amsterdam Mennonite church; it was formed by the gradual union of eleven congregations. In spite of many divisions the Mennonites of Amsterdam have always been of central importance to the church in Holland and beyond. The origin of the Amsterdam Anabaptist congregation goes back to 1530. At the close of this year Jan Volkertsz Trypmaker, a disciple of Melchior Hoffman, came from Emden to Amsterdam, where he became the head of a church, upon which he, like his teacher, urged peace and obedience to the government. In 1531 Hoffman himself was in Amsterdam and baptized many. In November the council of Amsterdam ordered the mayor to persecute the followers of the new doctrine. Trypmaker surrendered voluntarily, and with eight other Anabaptists was taken to The Hague and beheaded on 5 December 1531. Jan Matthyszoon, the Haarlem baker, soon appeared in Amsterdam as a prophet and sent out his 12 apostles, among them Jan Beuckelszoon of Leiden and Jacob van Campen (end of 1533). Early in 1534 the summons to go to Münster created a "crusade," which was, however, prevented (see Bergklooster). Meanwhile Jacob van Campen succeeded in gathering the peaceful elements and in persuading by letter the assembly of 32 preachers in Sparendam (near Amsterdam), to abandon the plan to storm the city (December 1534). The church in Amsterdam grew day by day. After Pentecost 1534 about 300 new members had joined; their total number is estimated (surely an exaggeration) at 3,500. The government succeeded in stopping a meeting of Anabaptists at the house of Jan Pauw. In February 1535 a group of 12 men and women, madly shouting in the streets at night, "Truth is naked," roused more anger than fear. They paid the death penalty. Meanwhile, however, a leader appeared for the insurgents. He was Jan van Geelen, who had escaped from Münster in December 1534. With 40 followers he stormed the courthouse during the night of 10 May 1535, where a celebration was taking place. The attack failed; in the scrimmage a burgomaster and several citizens fell. On the following morning the 11 surviving rioters were executed (see Naaktloopers). Now there began for the Anabaptist congregation, though it had had no part in the riot, a time of severe suffering. They had received some of the "crusaders" in their midst, like Hendrik van Maastricht, but they personally had only given warning and resistance to all insurrection; Pieter Koster of Zaandam opposed it with his pen. The government, spurred on by public indignation, delivered all the Anabaptists it could find to the executioner; 46, including many women, were executed in Amsterdam from 10 May to 28 July. Jacob van Campen was seized after a long search and cruelly killed (10 July 1535). Persecution lasted nearly 40 years. In some years the number of martyrs was unusually high; this was connected with political events, the inauguration of a new mayor (1542), the resumption of authority by the emperor (1552) and the Spanish reaction (1567). Sufficient grounds for condemnation were attendance at a meeting or having heard an Anabaptist preacher. Everywhere a spiritual relationship with the insurgents was assumed. The list of martyrs is long. In many cases only the name and method of execution are given. The very brevity and monotony of these reports make them shocking. In most cases they had for years not attended a Catholic service. How touching it is to read Clement Hendriks' letters! His greatest grief is the fact that the brethren think he has recanted; he does not tell his parents the tortures he has undergone and consoles them concerning his lot. What courage there was in Pieter Pieterszoon Bekjen, who mounted the stake singing a defiant hymn of faith, and in his friend Willem Janszoon, who upon hearing of his friend's execution, hastened to his side from Waterland in spite of many obstacles in order to cry, "Fight faithfully, dear brother!" It cost him his life. What honor is shown by Ellert Jansz and others, who would not flee, although they could have done so. They were mostly common people, craftsmen from the city, and sailors. Their letters betray piety rather than learning. But there were also respected and wealthy persons among them. In the sentences mention is made that according to an old charter their estates, all but 100 pounds, went to the emperor if they were citizens of Amsterdam; the rest went to the city coffers. A long visit of Menno Simons in about 1542 doubtless contributed a great deal toward strengthening the church. Claas Gerbrantsz of Wormer recalls his preaching 10 years later. In Jan Claeszoon, Menno found a loyal disciple, who as a bookseller was of great assistance in spreading his writings. The violent persecution of 1543 and 1544 probably drove Menno out of the city; two letters show that he kept up his connections with the congregation at Amsterdam (Menno Simons, Complete Works, Part I, 1871, 277-280, 281 f.) The former warns them not to attend Catholic services, and severely criticizes the excuse of the followers of Joris and Batenburg, that one could outwardly remain Catholic. The date of this letter is probably between 1545 and 1550. The second letter was probably written in 1557 or 1558. He urges the brethren to visit the victims of the plague. From the end of 1557 into 1558 while this dread disease ravaged the city, government orders forbade any contact with the victims. Menno says, "The hairs of your head are numbered; death is the door to the better life." The names of the preachers in this period of suffering are lost. Only of Jan Claeszoon is it said that he was a teacher of the Anabaptists; but many martyrs were baptized by Gillis van Aken, "a head and bishop of the Anabaptists," or heard him preach. Leenaert Bouwens also baptized 218 persons in Amsterdam after 1551. The congregation met for worship in small groups in the homes of friends, in attics and hiding-places, or at night on the gallows field, which, according to popular belief, was haunted by evil spirits, or in boats on the water. A weetdoener (notifier) informed the members of each meeting to be held. The number of members is estimated at about 2,000. From 1553 on the Anabaptists had a respite of a few years. 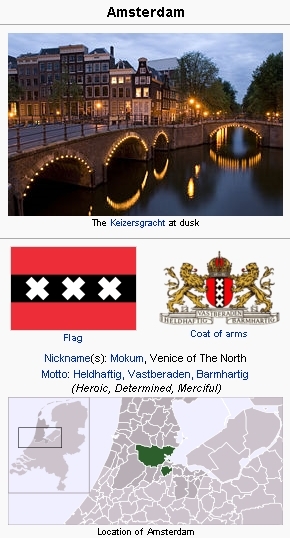 During the Spanish rule under Alba the stakes flamed up again; Amsterdam became known as Moorddam (Murderdam). To be sure, the character of the Anabaptists was now better known, and the name Wederdooper was being replaced by Mennist; nevertheless adult baptism was still a capital crime. Deliverance dawned when Prince William I forced the city to surrender in 1578. During these days it was decided to accept Mennonites as citizens without an oath. When the gates were opened, the refugees returned. Of 137 outsiders who became citizens, 26 were Anabaptists. Amsterdam now became the city of refuge for all that were persecuted for their faith. 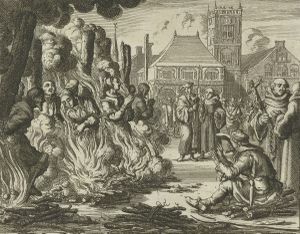 The Burning of Eight Mennonites in Amsterdam, 1549. Engraving by Jan Luiken in Martyrs Mirror, v. 2, Dutch edition. After 1581 the Mennonites in North Holland enjoyed toleration; in Amsterdam they were generously protected by the government. The reason for this was certainly that the Mennonites added to the wealth of the city by their energy and commercial skill, but also the fact that prominent families entered into connections with them. The government soon had occasion to defend the commercial interests of the Anabaptists when London authorities refused to release, without the sworn affidavits of the owners, goods belonging to Mennonites taken from Spanish prize ships. The government was able to refer to the fact that in Amsterdam the simple word of the Mennonites was sufficient. The Reformed, who had recently themselves been persecuted but were now the ruling church, sought to oppress the Anabaptists in Amsterdam and later (1597) to force a disputation with Lubbert Gerritsz; but the council put a stop to it. Now we hear more about the Mennonites; they are coming out of concealment. In 1578 they regularly met on the Nieuwendyk near the old Haarlem locks in the Emden or Conde quarter; but even as late as 1581 the place of meeting was announced beforehand. Already we meet the leading parties of Mennonites. The oldest and most numerous were the Waterlanders. In 1581 they held here the first conference, attended by 12 congregations, at which the first church discipline was adopted. Their most prominent leader was already Hans de Ries, who later had his residence at Alkmaar. About 1600 the following groups are mentioned: the Waterlanders meeting on the Teerketelsteeg and after 1615 on the Singel canal near the Jan Roodenpoortstoren, in de grote Spyker (the great warehouse) or by den Toren (at the gates); the Flemish or Contrahuiskoopers (anti-house-buyers) meeting after 1608 on the Singel near a brewery that had a lamb as its gable sign (today Odeon) in a storehouse which Härmen Hendriksz van Warendorp equipped for them as a meetinghouse and which was enlarged in 1639, called bij't Lam (Lamist congregation); the Old Flemish, also known as the Danzig Old Flemish on the N. Z. Achterburgwal at the "6 Kruikjes" (in 1620 a group separated from them, which met in the Tuinstraat, but returned in 1730). They practiced feetwashing only as a service of love for elders and preachers who visited them from the outside. There were also two branches of Frisians: the Jan Jacobsz group (from the province of Friesland) meeting in the Bloemstraat, and the Frisians (from the province of North Holland, led by Lubbert Gerritsz) meeting on the Heerengracht. The meeting place of the Hoogduitsen or High German group is not known. A variegated picture of church life! The early decades of the 17th century were characterized by efforts of the various branches of Mennonites to unite; to do this they had to overcome old prejudices, but they were not immune to new causes for dissension coming from without. They came in contact with the "world" and were influenced by the trends of the time. Amsterdam frequently led in this striving for unity. As early as 1591 the High Germans and the Frisians, represented by Leenaert Clock and Lubbert Gerritsz, united on the basis of the Concept of Cologne. After several years this united group made successful overtures to the Waterlanders. About 1594 the union took place in Amsterdam, in 1601 it was accomplished in most places; they were now called the Bevredigde Broederschap (Conciliated Brotherhood). They gave up separation from the world and began to call themselves Doopsgezinde (Baptism-minded) in preference to "Mennonites." In Amsterdam Lubbert Gerritsz was the most influential preacher. After his death some of the High German group separated from them, led by Leenaert Clock (1613). In 1615 the church was increased in size by the admission of an English congregation under John Smyth. Smyth belonged to the Brownists, a church existing in Amsterdam since 1593. To facilitate an understanding with him, Hans de Ries and Lubbert Gerritsz wrote a confession of faith in 1610, frequently called the Confession of Hans de Ries, but regarded by the Waterlanders as a personal confession. The church building of the English group was located in the Engelsche Steeg near the Bakkerstraat; until about 1640 English services were held for them. After a vain attempt at union between the Waterlanders and the Flemish in 1603, the Amsterdam Flemish in 1626 offered union to many congregations of the Frisians and High Germans on the basis of a confession of faith called Olyftacxken (Olive Branch). Encouraged by the favorable reception of the idea they issued in 1627 a "letter for preparation of peace" (brief tot. Vredebereiding), and in 1629 a "peace proposal" (Vrede-Presentatie). After a conference in Amsterdam, the Frisians and the High Germans replied by offering the Hoogduitsche Confessie, also called the Confession of Jan Cents (1630). On the way to successful solution, the union was postponed for several years, while the Flemish, torn apart by the "house-buying" quarrel, tried to reunite. This Flemish union finally took place in 1632 on the basis of the Dordrecht Confession. Part of the Flemish congregation, bij den Kruikjes, transferred to the Lamist congregation. In 1639 the union of the Flemish and the combined Frisians and High German group followed on the basis of the confessions of 1626 and 1632. With the exception of the three smaller groups, there were now in Amsterdam only the two large groups, the Lamist and the Toren congregations. Their union seemed to be near. In 1647 the Waterlanders tried again for union. Forty-one congregations sent delegates to Amsterdam for the first conference since 1581 (in 1611 a limited number of congregations had met in Amsterdam). In 1647 the old church discipline was revised and union was offered to all the Flemish, not only those in Amsterdam but in all Holland. In order to meet their request for a confession of faith, that of Hans de Ries was given them; but at the same time it was emphatically stated that no "confession should be placed over the Scriptures in authority and it should be valid only in so far as it agreed with the Holy Scriptures. This proposal met with little response; the negative answer followed in 1649, signed by Galenus Abrahamsz de Haan. Meanwhile a division was developing in the Lamist congregation which grew more serious than all the former divisions, involving the entire Dutch brotherhood. The Collegiants (also called Rijnsburgers) and Socinians, who had been spreading in Holland since 1600, entered the Mennonite congregations. In Amsterdam the sharp difference that had been engendered thereby (first among the Waterlanders) found expression in the disputes between Nittert Obbesz, the youngest minister of the Grote Spyker congregation, and Hans de Ries, 1622-1626. There were even disturbances in church services. Joost van den Vondel, the classical poet of Holland, who had recently been a deacon in the Toren congregation, took sides by writing Antidotum in 1627. The quarrel was not entirely eliminated by the mutual signing of a confession. Nittert Obbesz was not reinstated as a minister. The greatest effect of the Collegiant and Socinian influence was evident in the discord between Galenus Abrahamsz de Haan and Samuel Apostool in the Flemish Lamist congregation. The Collegiants, a widespread group in Holland with outspokenly anti-church principles, met in free assemblies (colleges) where all were permitted to speak. Baptism was by immersion. They also held the Lord's Supper, but neither ceremony was considered a required ordinance. Their meetings were open to members of all churches. Everywhere they secured sympathizers among the Mennonites. In Amsterdam, where they had been holding their meetings, Galenus joined them and soon became their leader. He had been chosen as minister of the Flemish in 1648 along with David Spruyt, a kindred spirit. Objections raised at their ordination were weakened by their agreement to the Olyjtacxken Confession, but shortly after 1650 the Lammerenkrijg broke out, which caused the great division among the Dutch Mennonites. The conservatives held fast to the confession of doctrine as necessary to salvation. The followers of Galenus put all the weight on Christian living. The Lammerenkrijg, which developed a deplorable personal bitterness, took place in three periods. In the Amsterdam congregation. The representatives of the ouderen, the ministers Tobias Goverts van den Wyngaart, Tileman Tiden, and Dr. de Vries, argued against Galenus and David Spruyt. The latter explained their views in 19 articles not intended for publication; they were published, however, without their knowledge in 1658 with a refutation. Galenus defended himself with an enlarged edition of the articles, refuting his opponents. He won many adherents in the congregation. The conservative members looked for support among outside preachers. The second period began with a meeting in Leiden in June 1660, where the significance of this dispute for the entire brotherhood was keenly felt. Four men, among them the well-known Tieleman Jansz van Braght, were sent to Amsterdam; they were to persuade the Galenus group to submit, or if they did not recant, to lay aside the office of preacher temporarily. Their message was not accepted at all, and when the conservative party tried to draw the visiting mediators before the Amsterdam church for a report and thus bring about a discussion, Galenus cited the rule of the church forbidding unrequested meddling from outside, and had the magistrate of Amsterdam intervene. In 1662 they arrived at a short truce; they were to tolerate each other in doctrine, life and views. During this time four ministers were chosen, two of them, Samuel Apostool and Isaac van Vreede, of the conservative group. But on 15 November 1662, the strife flared up anew; Apostool and Galenus attacked each other from the pulpit concerning the doctrine of redemption. Now the conservative group appealed to the Reformed for aid. At the instigation of the Reformed, Galenus was charged with Socinian views, but was exonerated by the Court of Holland in 1663. A peace proposal of the conservative party (December 1663) required the recognition of the conservative confessions and doctrines by the younger party; a violent quarrel broke out when the proposal was submitted. Now the magistrate of Amsterdam acted with vigor, and forbade all disputing about difficult questions that savored of Socinianism. But the cleavage was too deep, and when the party of Galenus was granted the church property, the conservative party separated under the leadership of Samuel Apostool, Tobias van den Wyngaard and Isaac van Vreede, with about 500 members (May or June 1664). Soon they were called Zonists after their chapel, a former brewery on the Singel, which had a sun for the gable sign. The other party remained in possession of the church van't Lam (Lamb); they were called Lamists. Externally viewed, the dispute was an affair of the ministers, but it had deeply excited the congregation. Not only did members take part in the disputations, but vituperative letters flew back and forth. The intervention of the Amsterdam government is not surprising, as there were occasional tumults on the streets. The government always strove to maintain quiet and religious toleration impartially. By about 1664 the Lamists had approximately 2,000 members. The Waterlanders approached them again; the peace proposal of 1647 was reprinted in 1667; in 1668 the union of the Lamist and Toren congregations took place, the united congregation being called Lamist and Toren group (van't Lam en bij den Toren). In 1676 the congregation had 2,369 members; in 1720, 2,000; in 1745, 1,500; and in 1801, before the union with the Zonists, about 800. Urged by the Rotterdam congregation, Galenus began to offer instruction to train young men for the ministry. He did this from 1681 until his death in 1706. In 1725 or 1727 the Frisians of Bloemstraat (Jan Jacobsz group) joined the Lamist and Toren congregation. In 1728 the last 16 members of this combined church handed the church property over; its history was without important events. The Zonists experienced divisions as well as growth; in 1670 a small group, called the Kleine Zon, left them and met in the Prinsenstraat, with an exit facing the Prinsengracht; in 1679, after long, futile negotiations with the Lamists, they returned to the Zonist congregation. A small group had separated from the Kleine Zon in 1675; their meeting place, Het Sterretje, was located on the Prinsengracht opposite the Noorderkerk. In 1692 Het Sterretje united with the Old Frisians. The latter had earlier assembled on the Heerengracht, but in 1664 had purchased from the Waterlanders the Oude Spyker (old warehouse) on the Teerketel-steeg and in 1702, with the consent of the magistrate, moved to the Kleine Zon on the Prinsengracht; the name "Arche Noe" was passed on to each new building. Shortly before their union with the Zonists, Marten Schagen, the famous historian, was their minister (1727-1738). On account of lack of preachers and small size of the congregation (in 1745, 150 members) they united with the Zonist congregation. Finally the Old Flemish at the Kruikjes followed, merging in 1788 with the Zonist congregation (in 1745, 65 members; 1788, f41 members). Thus the more conservative churches had all united. The Zonist congregation in 1745 consisted of about 500 members, in 1801 only of about 300. At the close of the 18th century there remained only two divergent congregations in Amsterdam, the Lamists and the Zonists. To call this period the time of "collapse" does not do it full justice. To be sure, viewed externally, the great decrease in numbers is obvious. There are many reasons for this. The earlier separation from the "world" had yielded to absorption by the world; the industry of the older generation had greatly increased their prosperity, for the Amsterdam Mennonites took part in all the great commercial enterprises. A certain simplicity still marked them, but wealth became apparent in many cases in costliness of dress and house furnishings. The enjoyment of worldly goods was no longer disparaged. Along the Vecht, a river in the province of Utrecht, many Amsterdam Mennonites had stately country homes; the place was called Mennisten Heme (Mennonite Heaven)! All of this led to a decline of interest in religious matters. Furthermore many members who wished to hold state offices transferred to the Reformed Church, as did the great-grandfather of the poet van Lennep (one branch of the van Lenneps remained Mennonite). The movement spread throughout the country; but the Amsterdam church probably suffered most severely. Meanwhile the attitude of the state to the Mennonites had also changed. In 1672 they were officially recognized. Fifty years earlier (1621) the Amsterdam magistrate had forbidden their ministers to perform marriages in the courthouse. The Mennonites complied; only the Frisians had their marriages first performed by ministers and then confirmed by the state. Besides this, the magistrate in 1714 required the introduction of "children's books," which were at first birth registers, and which were later, after the French period, used by the churches for their own purposes. The government favored the churches in permitting their religious and charitable institutions to remain tax-free. The Mennonites took as friendly as possible an attitude toward the state. In 1650 they assisted energetically in fortifying Amsterdam, and in 1672, when the Netherlands were threatened by Louis XIV, they offered large sums for the support of the army. The Lamist and Toren congregation contributed 5,000 florins; the gifts of the other congregations are not known. Later the Amsterdam congregations took an active part in the congratulation of William IV as Stadholder (1747). When the movement for independence flared up in the Netherlands, the Mennonites sided with the Patriots, the opponents of the stadholder of the House of Orange, and took up arms; the overthrow of the government was celebrated in the churches. In the 17th and 18th centuries the magistrates of Amsterdam had recognized the importance of the Mennonites in writing (1642) to Zürich on behalf of the persecuted Mennonites of Switzerland; and the repeated efforts of the States-General in favor of the Swiss and Palatine Mennonites were often instigated by Amsterdam Mennonites and supported by the magistrate. This was the case in the intervention of William III in 1694 and 1697 with the Palatine elector. In 1660 the magistrate praised the Mennonites for their generous gifts to the Waldenses. The Mennonites of Amsterdam had become a power to be reckoned with. Even though there was a perceptible decline among the Amsterdam Mennonites in church feeling and regard for the religion of their forefathers, a part of the heritage was preserved—a practical Christianity. This was most evident in the generous support of brethren in other countries, in which the Amsterdam congregations took the lead. In the face of want among the brethren, all differences disappeared. The Lamists gave help to the Palatine Mennonites as early as 1672. After the persecutions (1694) the Lamist, Zonist and Frisian congregations united to aid them, and when Bern (1709) decided upon the complete eradication of the Mennonites, a conference of the Mennonite churches in Holland was held in Amsterdam. In 1710 the Commissie tot de buitenlandsche nooden (Commission for Foreign Needs) was appointed, consisting of delegates of the three Amsterdam churches. In 1726 a permanent relief fund was established by the commission. The Commissie met for the last time in 1758, and the fund was dissolved in 1803. Though all Dutch Mennonite congregations contributed generously to this work of charity, Amsterdam was the heart of the Commissie. In the Amsterdam churches, the Lamist and Toren congregation paid in 1727, 8,470 florins; 1773, 14,500 florins; 1736, 12,000 florins: the Zonist congregation paid 1,824, 4,902, and 2,575 florins: Frisians and the Frisian Societeit 3,165, 5,174, and 7,625 florins: the Kruikjes congregation 435, 132, and 3,240 florins. The inclination toward the practical brought about in the congregations an exemplary system of relief for the poor; the contemporary writers, Rues and especially Jan Wagenaar give detailed descriptions. It is worthy of note that Theodor Fliedner received his impulse to found the German deaconess system in his study of poor-relief among the Amsterdam Mennonites. The Amsterdam Mennonites also supported public charitable institutions. Thus the Maatschappij tot Nut van't Algemeen (Society for the Promotion of the Common Good), the great interdenominational organization for national welfare, founded by the Mennonite minister Jan Nieuwenhuyzen of Monnikendam, received the warmest support from the ministers J. A. Hoekstra and A. H. van Gelder; the latter was for years an active director and had charge of disbursements. The Institute for the Deaf in Groningen had the cooperation of the Mennonite Seminary professors Hesselink and R. Koopmans. The inner life of the Amsterdam churches proceeded smoothly. After the division, when each party found its own field of work, bitterness subsided. Futile attempts at union were made in 1672, 1684, 1685, and 1691 by the Zonists. Until Galenus' death in 1706 his powerful personality dominated the Lamists. Among his successors the influence of the Remonstrants was more pronounced, the need for educated ministers and the lack of a seminary of their own favored an approach (see Amsterdam Seminary). The Remonstrant candidate J. Bremer served first the Mennonites of Leiden, then in Amsterdam. The most noteworthy evidence of the change is the 17 articles that were presented to J. Stinstra when he was called to become the minister of the Lamist congregation in 1735. His signature was considered important "because unity in doctrine is the foundation of the peace and edification of the church." The articles were mostly Remonstrant statements and a rejection of Socinianism; only two articles deal with baptism and the oath. Rues thought he was justified in calling the Lamists "Remonstrant Mennonites." Connections with the Collegiants were also loosened; the latter died out, holding their last meeting in Amsterdam in 1791. The change in congregational life of the Lamist church was also evident in the ability of ministers of different branches to work together harmoniously. Thus Bremer and van Leuvenig worked side by side with the pietistic Joannes Deknatel. In the latter the Herrnhut group (Moravians), appearing in Holland from 1738 on, found a potent friend and advocate. The focal position of the Amsterdam congregation actually increased during this period. Rues, the diligent and exact observer, frequently pointed this out. "During the time of Galenus the influence of the Lamists asserted itself through the outstanding personality of this man, the wealth of the church, and its love of knowledge." The church acquired a central position, becoming "the focal point for a large proportion of Mennonites." Certainly their open-minded generosity played an important role here. Many small and weak congregations in Holland and elsewhere were supported; but of equal importance was the opening of the seminary by the Lamist congregation in 1735. Here the future ministers received their training, needy students were supported, and many congregations provided with preachers. Just in this period of transition from lay preachers to trained preachers and the consequent lack of preachers, causing congregations to die out, the seminary aided as much as possible. The archives testify to the extensive correspondence between Amsterdam and other congregations in these matters. Well-known ministers of the Amsterdam Lamist congregation were Bartholomeus van Leuvenig, 1712-1743; Joannes Deknatel, 1726-1757; Johannes Bremer, 1728-1757; Gerardus van Heyningen, 1758-1801; Allard Hulshoff, 1759-1795; and Willem de Vos, 1762-1814. The Zonist congregation, which had always had a smaller membership than the Lamist church, had also some prominent ministers, such as Hermannus Schijn in 1690-1727, Gerardus Maatschoen in 1726-1750, Pieter Smidt in 1728-1781, who also was appointed as a professor for training ministers, and Arend Hendrik van Gelder in 1780-1819. At the end of this period the Zonists again approached the Lamists. Financial conditions in the Zonist congregation made a union desirable. Of the old antipathy nothing was left. In some respects the Lamists were closer to the old tradition than the Zonists. The Kleine Bündel (hymnbook), completed in 1791, and in 1793 in use as a hymnal by the Lamists, is much more evangelical than the Groote Bündel, adopted in 1796 by the Zonists, which contained hymns of definitely rationalistic character. The attempt at union failed in 1795, but was successful in 1801 (April 22). Everything was peacefully settled. A stone was placed in the gable of the Singelkerk building (1949) to commemorate the union between the congregations bij 't Lam and van den Toren in 1668, and between these and the Zonist congregation in 1801. During the 19th century there seems to have been a strengthening of the church. In the first place, a concentration of forces took place. The new name of the church, Vereenigde Doopsgezinde Gemeente (United Mennonite Church), hardly suggests the old disputes. Outwardly this is shown in many respects. In the composition of the church council and the appointment of preachers complete merging took place. Two ministers of the Zonist congregation were retired; their third minister, A. H. van Gelder, became a minister of the united church. Three church buildings were, of course, too many for a membership of about 1,100; hence the Zonist church was sold; the Toren church was rented out in 1812 and sold in 1813; the rooms needed for counseling, auditorium, library, etc., which had up to this time been located at the church bij 't Lam were remodeled. This church (Singelkerk) was now the only one used by the Mennonites, and was completely remodeled and enlarged in 1840. As hymnals both the Groote Bündel and the Kleine Bündel were used, besides a version of the Psalms in modern poetic form, published by the Art Union, Laus Deo salus populo, which had already been used by the Zonist and Lamist congregations since 1762 and 1791 respectively. The union of 1801 was of highest significance to the immediate future. After ten years of working together the two groups were so completely merged that they could act as a unit, permitting the Amsterdam congregation to take the initiative in forming the Algemene Doopsgezinde Sociëteit (ADS). The Amsterdam congregation now cooperated with other congregations in trying to revitalize the brotherhood. Because of its great historic services (entire support of the seminary for seventy-five years) and its liberal contributions for the formation of the ADS, the Amsterdam church was given the leadership; it became to a still greater extent the Mennonite center in Holland. It was certainly not an insignificant sign that professors Muller, van Gilse, and de Hoop-Scheffer gave up the office of minister of the Amsterdam church for that of a seminary professor. The most important professors were close to the most important men of the church; reciprocal influence of one upon the other naturally followed. The early professors were obliged to preach for the church several times a year. The pietistic Jan de Liefde opposed the predominant position which Amsterdam held in the brotherhood and attacked the power of money, but with no effect. At the beginning of the 19th century, leadership fortunately lay in strong hands. By 1840 the crisis was past, and from there on, conditions slowly improved. The most prominent personality of the first half of the century was undoubtedly Samuel Muller. In opposition to the trend that was concerned only with "politics, social betterment and nature study," he demanded a Biblical theology and a Christianity that, though no less remote from dogmatism than that of the preceding century, would address itself to the religious sense rather than the intellect: It was his lifework to raise the Mennonites to a level equal to that of the other Protestant churches; the genuinely Mennonite features were to be emphasized. To that end he labored as a preacher, to that end he taught and did research in Mennonite history. 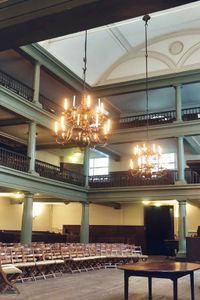 The Dutch Mennonite Missionary Society owes its founding to him (1847); it has always had its seat in Amsterdam, and it has had very active support from a part of the congregation. The congregation acted again in the interest of the public in 1844 when the church council set up a savings bank (Spaarkas), then lacking in Amsterdam. The Zondagsbode was published in Amsterdam (1887 ff. ); it was long edited by P. Feenstra, Jr., minister in Amsterdam. The population of Amsterdam increased steadily. By 1947 it had 803,000 inhabitants. The congregation also grew, though at a slower rate, until about 1935, when the membership in the city and vicinity had reached over 6,000. Since 1935 it has declined somewhat. In 1950, the membership was 5,522. The city was divided into four and then into five districts for pastoral visits and catechetical instruction as well as for further spiritual work and for the deacons' work. Each district has its own minister for visitation work, who is assisted by a religious instructor and a district committee. The work of the deacons in the district was looked after by one of the 20 supervisors (opzieners) and deacons, who also had charge of the administration of the church properties and the contributions made by the members and of the upkeep of the buildings. Together with the ministers they constituted the church board that directed the congregation. In 1904 a second church building was opened, located at Oosterpark 5. Since 1920, Nieuwendam, with a small frame church built in 1843, was also a part of the city. In 1930 a district house with a chapel was built at Karperweg 5. By the mid-1950s there were five places in Amsterdam where Sunday morning services were regularly held. From the union of the Lamists and Zonists in 1801 until 1953 the Amsterdam congregation was served by the following ministers: from the Lamists came Willem de Vos, who served until 1814; Hoito Tichelaar until 1810; Rinse Koopmans until 1826. From the Zonists came A. H. van Gelder, who served until 1819; other ministers were Sam. Müller, 1814-1829; Jan van Geuns, 1814-1829; Jan ter Borg, 1818-1829; Abr. Doyer, 1828-1851; Jan Boeke, 1830-1854; Jan van Gilse, 1837-1849; J. G. de Hoop-Scheffer, 1849-1859; P. van der Goot, 1851-1876; A. Loosjes, 1854-1893; Taco Kuiper, 1862-1891; R. Brouwer, 1876-1877; I. J. le Cosquino de Bussy, 1878-1884; J. Boetje, 1884-1890; W. I. Leendertz, 1890-1912; P. Feenstra, Jr., 1891-1916; I. H. Boeke, 1893-1911; A. K. Kuiper, 1901-1930; P. B. Westerdijk, 1911-1934; Vine. Loosjes, 1912-1921; F. Dijkema, 1916-1942; J. W. van Stuyvenberg, 1921-1936; C. Nijdam, 1930-1933; J. D. Dozy, 1933- ; O. L. van der Veen, 1935- ; T. O. M. H. Hylkema, 1936-1949; G. J. W. den Herder, 1942- ; W. F. Golterman, 1942-1946; Fr. Kuiper, 1947- ; Miss C. W. Brugman, 1947- ; H. Bremer, 1949- . The number of children in Sunday school and of catechumens sharply decreased during the 20th century. At the time of greatest extent there were approximately 1,800 children; by the 1950s there were scarcely half that number. The reason for this is in the first place the general indifference to the church and religion, then also the smaller size of the families of the members (seldom more than three, very seldom more than six). The fact that government care of the poor provided for non-church members as well as the church provided for its members was a contributory factor, since the poor families who were not interested in religion were no longer urged by their children to join a church, as was previously frequently the case. Toward the end of the 19th century and in the early 20th the question was warmly debated whether a person baptized as an infant in another denomination could be admitted into the Amsterdam congregation—even though he or she had in the meantime been admitted into another Mennonite congregation; after 1949 admission was offered to members of any Christian faith (hence also to Roman Catholics). The applicant was, however, examined to determine whether his or her desire to unite with the Mennonites was genuine. The number of men and women from non-Mennonite circles who were baptized at an advanced age (some at seventy or older) was increasing. A considerable proportion of the members of the Amsterdam congregation was thus of non-Mennonite extraction in the 1950s. The five deaconesses together with several deacons had the management of the hofjes (homes for the aged and the poor). The Rijpenhofje was acquired by the Lamist and Toren congregation in 1747 as a gift of the de Rijp-Centen family. In 1912 it was completely renovated; by the 1950s it comprised twenty free apartments for elderly single women. The Zonshofje at Prinsengracht 159-171 was built in 1765 on the site of the former church known as De kleine Zon (later Arke Noach) and was enlarged at the end of the nineteenth century by the addition of a wing. It had room for thirty-two unattached elderly women. The home for the aged and the orphanage of the Zonists established in 1667 in Tuinstraat, was discontinued in 1799. 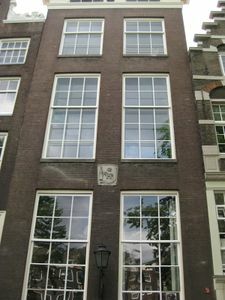 The Lamist congregation established a large home for the aged in 1669 at Kerkstraat 312, with a large garden on the Heerengracht. For want of clients this house was closed at the close of the nineteenth century. In 1946 plans began taking shape for a new charitable home for the Amsterdam congregation. The Lindenhofje, founded in 1614 by the Waterlander Toren congregation, was sold in 1801. The Huizen de Vogel, Kerkstraat 316-320, provided lodging for nine aged married couples. De Lelie, Bloemstraat 129-131, provided a home for seven elderly married couples and four unattached men. Orphans were formerly cared for in families by both the Zonists and the Frisians. The Lamist congregation opened an. orphanage in 1677 on the Prinsengracht, and later the Huizen de Vogel, in the Kerkstraat, which was discontinued in 1800. The orphans were then transferred to the Collegiant home, De Oranje Appel, which had already been accepting many Mennonite orphans. Since then this orphanage has had exclusively Mennonite directors, some of whom were appointed by the supervisors and deacons of the Amsterdam congregation. Until 1923 it was located at the Heerengracht near the Huidenstraat, and later at De Lairessestraat, since 1930 at Hilversum. In 1950 there were about 30 orphans, some of them from outside Amsterdam. A number of orphans of Mennonite parentage and several children whose parents were deprived of guardianship have been placed in families under the responsibility of the Commissie voor de Buitenbestedelingen. Beginning in 1894 the Doopsgezinde Wijkverpleging (Mennonite district nursing) had charge of nursing care in the home, with three nurses. The Association for Providing Nourishing Food furnished needy Mennonite patients with milk, eggs and meals. Since 1938 the Amsterdam congregation in cooperation with the congregation in Utrecht directed the originally non-Mennonite brotherhood house at Bilthoven. Braght, Thieleman J. van. Het Bloedigh Tooneel of Martelaers Spiegel der Doops-gesinde of Weereloose Christenen, Die om 't getuygenis van Jesus haren Salighmaker geleden hebben ende gedood zijn van Christi tijd of tot desen tijd toe. Den Tweeden Druk. Amsterdam: Hieronymus Sweerts, 1685: Part II, 411. Braght, Thieleman J. van. The Bloody Theatre or Martyrs' Mirror of the Defenseless Christians Who Baptized Only upon Confession of Faith and Who Suffered and Died for the Testimony of Jesus Their Saviour . . . to the Year A.D. 1660. Scottdale, PA: Herald Press, 1951: 763. Available online at: http://www.homecomers.org/mirror/index.htm. Brons, Anna. Ursprung, Entwickelung und Schicksale der altevangelischen Taufgesinnten : oder Mennoniten in kurzen Zügen übersichtlich dargestellt. 3rd ed. Emden, 1912. Cate, Steven Blaupot ten. Geschiedenis der Doopsgezinden in Holland, Zeeland, Utrecht en Gelderland, 2 vols. Amsterdam: P.N. van Kampen, 1847: v. I and II. Cramer, Samuel. "De Doopsgezinden broederschap in de 19e eeuw." Doopsgezinde Bijdragen (1901). Cramer, Samuel. "De vereeniging der twee amst. gem. in 1801." Doopsgezinde Bijdragen (1898). Cramer, Samuel and Fredrik Pijper. Bibliotheca Reformatoria Neerlandica, 10 vols. The Hague: M. Nijhoff, 1903-1914: v. II, 78 ff., 478 ff., 654; VII, 30-45. Gouw, J. ter. Gesch. van Amst. IV-VII .Amsterdam, 1884-1891. Grosheide, Greta. Bijdrage tot de geschiedenis der Anabaptisten in Amsterdam. Hilversum: J. Schipper, Jr., 1938. Hege, Christian and Christian Neff. Mennonitisches Lexikon, 4 vols. Frankfurt & Weierhof: Hege; Karlsruhe: Schneider, 1913-1967: v. I, 58-66. Hoop-Scheffer, Jacob Gijsbert de. De Broederschap der Doopsgezinden. Amsterdam: G. Portielje & Zoon, 1866. Hoop-Scheffer, Jacob Gijsbert de. Geschiedenis der kerkhervorming in Nederland : van haar ontstaan tot 1531. Amsterdam: G.L. Funke, 1873. Kühler, Wilhelmus Johannes. Geschiedenis der Nederlandsche Doopsgezinden in de Zestiende Eeuw. Haarlem: H.D. Tjeenk Willink, 1932. Kühler, Wilhelmus Johannes. Geschiedenis van de Doopsgezinden in Nederland II. 1600-1735 Eerste Helft. Haarlem: H.D. Tjeenk Willink & Zoon n.v., 1940. Kühler, Wilhelmus Johannes. Geschiedenis van de Doopsgezinden in Nederland: Gemeentelijk Leven 1650-1735. Haarlem: H.D. Tjeenk Willink & Zoon, 1950: I, II, and III. Kühler, Wilhelmus Johannes. Het Socianisme in Nederland Leiden: Sijthoff, 1912. Linden, Friederich Otto zur. Melchior Hofmann: ein Prophet der Wiedertäufer. Haarlem : De Erven F. Bohn, 1885. Rues, S. F. Tegenwoordige staet der Doopsgezinden of Mennoniten, in de Vereenigde Nederlanden : waeragter komt een berigt van de Rynsburgers of Collegianten: beide ter vertooninge van de leer, uiterlyken toestand, en godsdienstige gebruiken dezer kerkelyke genootschappen; nevens een verhael wegens den oorsprong en voortgang van de jongstleden geschillen der eerstgemelde, met de leeraers der Gereformeerde Kerke. Translated and edited by M. Schagen. Amsterdam: F. Houttuyn, 1745. Sepp, Christiaan. Johannes Stinstra en zijn tijd : eene bijdrage tot de geschiedenis der kerk en school in de 18e eeuw. Amsterdam: J. C. Sepp, 1865-1866. "Verhooren en Vonissen der Wederdoopers, betrokken bij de aanslagen op Amsterdam in 1534 en 1535", in Bijdragen en Mededeelingen van het Historisch Genootschap 41 (Amsterdam, 1920). Available in full electronic text at http://www.dbnl.org/tekst/_bij005192001_01/_bij005192001_01_0005.php. Wagenaar, J. Amsterdam, in zyne opkomst, aanwas, geschiedenissen, voorregten, koophandel, gebouwen, kerkenstaat, schoolen, schutterye, gilden en regeeringe, beschreeve. Amsterdam: Isaak Tirion, 1760-1765. Church website: Verenigde Doopsgezinde Gemeente Amsterdam. Doornkat Koolman, J. ten and Frits Kuiper. "Amsterdam (Noord-Holland, Netherlands)." Global Anabaptist Mennonite Encyclopedia Online. 1953. Web. 22 Apr 2019. http://gameo.org/index.php?title=Amsterdam_(Noord-Holland,_Netherlands)&oldid=147903. Doornkat Koolman, J. ten and Frits Kuiper. (1953). Amsterdam (Noord-Holland, Netherlands). Global Anabaptist Mennonite Encyclopedia Online. Retrieved 22 April 2019, from http://gameo.org/index.php?title=Amsterdam_(Noord-Holland,_Netherlands)&oldid=147903. Adapted by permission of Herald Press, Harrisonburg, Virginia, from Mennonite Encyclopedia, Vol. 1, pp. 101-108. All rights reserved. This page was last modified on 21 April 2017, at 11:39.